Først tror du det løgn, så tror du det er The Beatles. Med SGT. 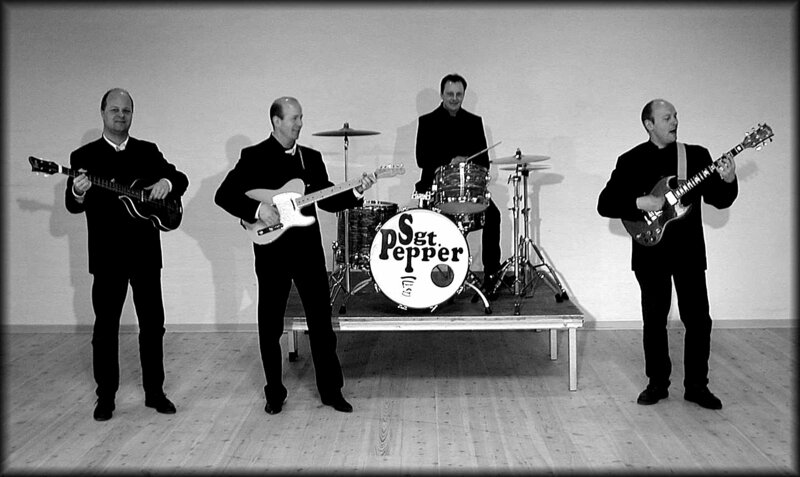 PEPPER er der dømt 60’er stemning, fællessang og dans. en ordentlig omgang med de gode gamle kendte Beatles sange. i festligt selskab med SGT. PEPPER. Hold Me Tight, Please Mr. Postman, Please Please Me, Love Me Do, Sgt. Peppers, With A Little Help, Back In The USSR, I Should Have Known B., Any Time At All, I’m Down, One After 909, Day Tripper, She’s A Women, It Won’t Be Long, Tell Me Why, Run For Your Life, Let It Be, Don’t Let Me Down, Ob La Di Ob La Da, I Saw Her Standing There, When I Get Home, Drive My Car, I Feel Fine, Lady Madonna, Doctor Robert, Birthday, Taxman, I Wanna Be Your Man, Hey Jude, Nowhere Man, Help, Twist and Shout, Johnny B Goode og Yellow Submarine.